The First Lady exercises her Second Amendment rights – the right to bare arms. There’s no way for me to write about the First Lady without gushing so I’m not even gonna try. I think she’s fabulous. I love how intelligent she is, and how tough. I love that speech she gave at the Democratic National Convention, and I really love that she wrote it herself. I love the little glimpses we get of her relationship with the President, and I love that they have raised a pair of smart, well-adjusted kids. Whenever I read anything by her or hear her talk, I always can’t help but beam with pride. And yes, I really admire her fashion sense, too. I’m not ashamed to admit that I gasped when she walked on stage wearing that pink-silvery halter dress. Revoke my Official Feminist Credentials if you must, but the lady looked smashing. At the end of Obama’s fantastic DNC speech, she referred to herself at the “Mom-in-Chief” – which, by the way, read this if you are one of the people (and there are a lot of you) who took issue with that statement – but I would like to ask that she consider another title as well: “Athlete-in-Chief.” After all, has there ever been another First Lady who is so athletic and proud of it? Who flaunts her hard-earned biceps with such style and elegance? Who seems as comfortable doing push-ups as she is at state dinners? As a fitness junkie, I love that she’s out there promoting healthy living and eating among kids. I think it’s awesome that her rise in the public sphere was followed by an equal rise in articles about the “Michelle Obama Arm Workout,” and in the process showing U.S. women that Big is Beautiful, especially when it comes to Biceps. I love that she talks about how she doesn’t do calorie-counting or diets and that she likes to lift weights. Not everyone agrees with my perspective. I once read a letter to the editor in Oxygen magazine that actually criticized the fact that Obama has been held up as a fitness role model, saying that it’s a disgrace because she had “too much body fat” or some such nonsense. When the publisher of the magazine wrote that he agreed with the letter-writer, I knew that was the end of my relationship with that magazine, and I haven’t bought an issue since. The kind of sacrifices, single-minded intensity and physical ability required to develop a fitness model’s physique are out of the reach of most women – myself included – and so I think we’re all much better served by realistic role models who show that it’s possible to get fit and healthy while still managing to have a career and a family, instead of spending all our time weighing chicken breasts and working on our triceps, you know? That’s one of the things I like about Obama: she puts out an idea of fitness that sees it as a means to having a more fulfilling life. Fitness as a hobby is cool for some of us, but most of us just don’t roll that way, and those of us who aren’t obsessed with developing the perfect six-pack need fitness role models too. Amen! I’m a big fan of Michelle and I also loved her DNC speech dress! It’s also soooooo very refreshing to see a President and First Lady who actually seem to enjoy each other’s company, have a warm and chummy relationship that seems quite egalitarian, real, and admirable, and who I personally can relate to. The previous incarnations in my lifetime seemed like cardboard cutouts who were manufactured to fit gender roles and concepts of marriage that seemed foreign and unappealing to me. Well said. 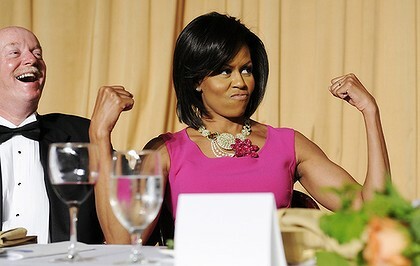 Michelle is a graceful, strong lady. I love all the photos of Michelle – she looks awesome! great pics of michelle. She is the stong lady and beautiful personality we have to learn from this lady how to keep ourself happy. Love this blog. 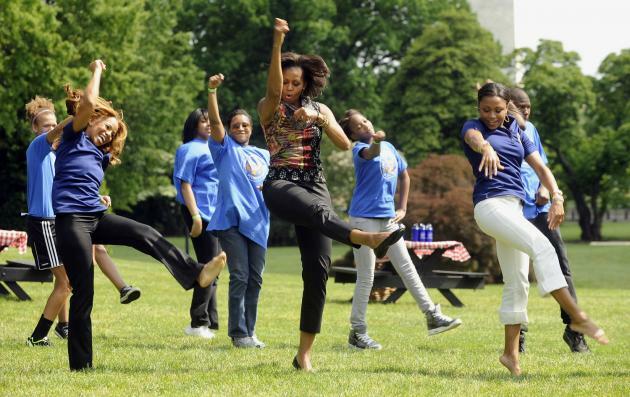 There are things about Michelle Obama that I really admire, but her Let\’s Move campaign is not one of them. She had the opportunity to start a productive dialogue about health and fitness for kids, about providing wholesome and nutritious foods to everyone in the US, and about finding fun ways for kids to move their bodies. Instead of focusing on health practices or even legitimate health outcomes, she chooses to focus on \”eliminating childhood obesity.\” It\’s an incredibly negative and fat-phobic frame for the issue that is completely unnecessary. The campaign has great components, but why focus on eliminating fat versus achieving health? The two are not the same (there are plenty of health fat folks and plenty of unhealthy thin folks). Fat kids are bullied enough without the First Lady adding fuel to the fire. I think this is a very valid point. I would like to think there is a better way to frame this than “war on childhood obesity.” I’m hoping that with all of the recent research – coupled with so many actual personal experiences – that the tide will soon turn on this whole fat=unhealthy idea. Wow, I can’t believe the editor of Oxygen put a sentiment like that into print. I love that she says she doesn’t weigh herself but likes to lift weights. Whether it\’s the blogger community, or the wider world of fitness media and press finding pro-fitness voices that aren’t necessarily pro-dieting or pro-food restriction is so hard. But NB brings up a great point. I\’m not sure how else she\’d be able to frame it to get as much attention as she has, which isn’t entirely her fault…that\’s how the issues of kids’ health, nutrition and lack of access to physical activity is framed in the larger culture, for better or worse. I really admire the first lady – well just period. But one of the aspects I really look up to her and how she is encouraging the Nation to live a healthier lifestyle. And showing them that it can be a positive, affordable, permanent change. Some of my clients though use Michelle’s arms as the example of what they do not want to look like. It is so sad that instead of admiring her physique and seeing her efforts to take care of herself as empowering they see it and think her arms look like a man. I wish there was a way to change society’s views. Just started reading your blog and this entry is awesome! I also LOVE Michelle Obama. She is an amazing woman. Graceful, Beautiful, Intelligent, Strong! She’s my idol 🙂 Great Post!